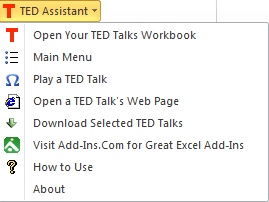 The TED Assistant for Excel allows you to quickly and easily find and download TED talks. TED talks are found at www.ted.com. They range from talks on Technology, Entertainment and Design (TED). There are almost 2000 such talks, ranging from a few minutes to almost an hour. Most are about 10 minutes long and are extremely interesting. One of our favorite things we do is to download TED talks to our phone as podcasts then play them back when we are traveling! The TED Assistant will download the talks you select so you can copy to your phone or tablet. As new talks are added each week, the TED Assistant can update your list of talks in less than a minute. And, you can mark the talks you have downloaded or listened to so that you don't accidentally download twice. The menu item "Main Menu" will create your initial TED talks workbook and allow you to update and help you sort it. The TED Assistant is free - no purchase ever required. Does not expire. No nag screens. The TED Assistant works on Microsoft Windows. It does not work on Macs. If anyone wants to develop a Mac version, please contact us.